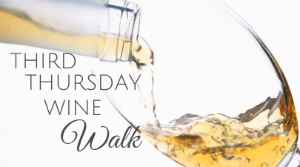 Downtown Punta Gorda merchants -- including Copperfish Books -- are pleased to present Third Thursday Wine Walk on the third Thursday of every month. To sample wines, get a wristband ($10 donation) prior to the event from the Punta Gorda Chamber (252 W Marion Avenue). Tickets will also be available on the night of the event at the Chamber and at select downtown businesses. You'll receive a map of all participating merchants so you'll know where to go to enjoy a variety of wine at each location. Even if you don't want the wine, come on out for Punta Gorda's downtown Third Thursday tradition!